(28) London, West End, England – Drinks, chats and a catch-up with three notables in the pop/rock publishing world; Doug Hinman (the world’s leading Kinks historian), Andy Neill (Faces biographer) and Johnny Rogan (Byrds author). Earlier in the day, paperback copies of Keith’s Marilyn book were spotted in the “Highlights – New Releases” section in the prestigious Foyles bookstore on Charing Cross Road. (20) London, England – Meeting in London with Keith’s long-time friend and Monty Python / Status Quo documentary director, Alan G. Parker. A number of collaborations were discussed. Watch this space! (12) Bloomsbury, London – Lunch meeting with Brent Kubasta, host of the weekly archive music radio show, Magic Transistor Radio, on the Rollins station, WPRK, Florida. As they munched our way through our most exquisite Indian meal, all manner of topics were discussed, namely Marilyn Monroe, The Beatles and, of course, our beloved Beach Boys. 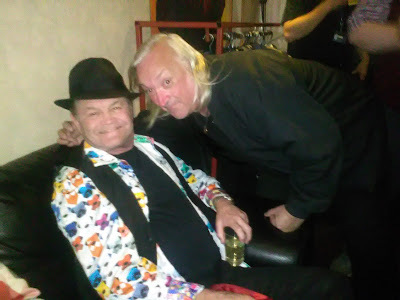 (14) Rhythm Factory, London – Keith was in attendance at the launch of the new Mike Chapman produced & directed, Chords DVD, What Became of the People? A performance by the group themselves rounded off a truly top evening! Prior to that, Keith was a guest on a live BBC Radio phone-in, to discuss the preserving of 9 Madryn Street, Toxteth, Liverpool the former home of ex-Beatle, Ringo Starr. A playing of The Fabs’ ‘We Can Work It Out’ wrapped the short piece. (8) Brazil – Further promotions for Marilyn book: Keith conducted an on-line interview with Rogerio Borges of the highly respected Brazilian newspaper, O Popular. (7) America – Promotions for Marilyn Monroe: The Final Years continue in the States, prompting advance sales of the sales. Today in the Marilyn biographies/ memoirs section on Amazon.com, Keith’s book reaches the No.10 position.